In 2015, we built our first community solar project at Jiminy Peak Mountain Resort. 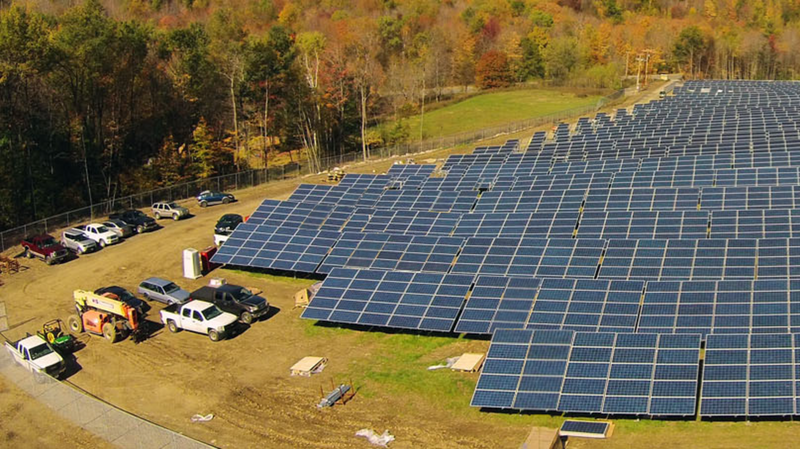 Covering 12 acres near the base of the resort, Nexamp Peak was the largest community solar project in the northeast to date. Nexamp Peak will save over 100 local residents and small businesses hundreds of thousands of dollars through our Solarize My Bill community solar program. Combined with Jiminy Peak's existing 1.5 MW wind turbine, 75 kW cogeneration unit, and extensive conservation efforts, this solar array enables the resort to offset 90% of its energy needs from local renewable resources, making Jiminy Peak one of the greenest four-season resorts in the nation. Nexamp acquired the development rights for the project from EOS Ventures, a renewable energy company focusing on wind, solar and cogeneration projects. We were thrilled to partner with Nexamp to add solar energy into the mix in such a way that the neighboring community can benefit from the facility, too.